With rounded edges and a streamlined design, the versatile P8 is compact 77.7mm x 46mm x 15.8mm and easy to carry. Unlike other card readers with confusing designs, all four of the P8s card slots are clearly labeled to avoid confusion and save time. Just plug the P8 directly into any USB2.0 port to lightning fast and hassle-free transfer of music, videos, photos or documents. In addition, each P8 Card Reader comes with free photo recovery software that features quick and easy previews of recoverable data. This useful software can help users easily restore lost or damaged files with just a few mouse clicks.With support for high-speed Ultra DMA transfer mode, Transcends P8 USB Card Reader assures ultimate compatibility and speed, especially when using high-speed 300X CompactFlash cards. The P8 directly accepts the most popular memory cards currently available, including CF, SD, SDHC, MMC, MMCplus, RS-MMC, MMCmobile, microSD, microSDHC and Memory Stick series cards. Moreover, it also supports miniSD, miniSDHC, and MMCmicro with an adapter. 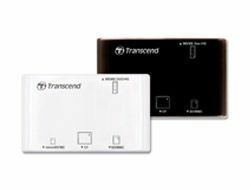 Transcends P8 card reader is the perfect companion for all your memory cards. - Fully Compliant with the Hi-Speed USB 2.0 specification. - USB powered no external power or battery needed. - LED indicates card insertion and data traffic. - Compatible with the new SDHC standard.